....of the season of course! I am of the camp that believes that cocktails like food and attire is seasonal. 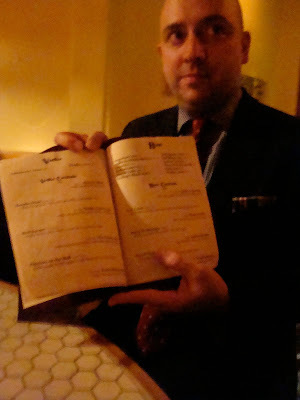 I would not order a Rye Manhattan in the middle of July anymore than have a Thanksgiving turkey or wear a tweed blazer. This goes for Manhattan's extended family, Perfect, Little Italy, the Greenpoint, Brooklyn, Slope, Brooklyn Heights, Bensonhurst, Red Hook et al. Sorry fellas, I'll see you in the Fall. See, in the colder months a cocktail like the Manhattan with it's hearty rye, fortified sweet vermouth, and bitters warms you up. It thins the blood and nourishes the soul like a harvest meal. It is the equivalent of sitting by the fireplace after a day out in the bitter cold. I credit my grandmother Margaret for imparting me with this unwritten etiquette. Moving from heavy cocktails to light refreshing ones was her seasonal ritual. The family party pitcher of Manhattans was replaced by Gin and Tonics and Gin Rickeys at the Memorial Day BBQ. Sure this follows the "wear white shoes" until Labor Day fashion of an older time but that custom actually makes sense. In colder months you need stiff cocktails to warm you up, while in warmer months the opposite is true. Ice cold, refreshing drinks that contain a modest amount of alcohol should be imbibed. This mantra helps avoid dehydration and still gives you that zing in your white shoe step. The seasonal transition does not necessarily have to start on Memorial Day but I follow that marker out of tradition. I look forward to the summer cocktails much like a good BBQ or beach vacation. In the same vein, I will miss the Manhattan and really enjoy the first sip of one in September because for me absence makes the heart grow fonder. I actually choose where to have my first one after Labor Day very carefully. OK, it is usually at Clover Club in Brooklyn but that is because my friend and owner Julie Reiner is a Manhattan-phile like me and her cocktails are served with that bonus dividend!! So tonight, Sunday May 30th, I enjoyed my last Manhattan of the season. It was lovely and warmed me up just right. Until September old friend, when our paths shall meet again. Cin-Cin! Combine over ice and stir until chilled. Strain into a frosty coupe and garnish the Luxardo maraschino cherry. Celebrate the vibrant history of America this Memorial Day weekend at the Star Spangled Soiree! Patriotic vintage dance tunes brought to you by favorites SLY BLUE & JESSE SELENGUT! Free Hors D'Oeuvres 7pm-8pm...come down early and have dinner at Flute! FREE BEGINNER DANCE LESSON - 830pm! Jeri Lynn Astra helps you tap those toes! Come in your finest vintage patriotic attire - 1910s/1920s/1930s/1940s! 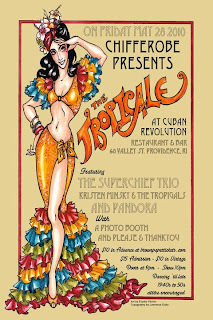 Bring out that red, white, and blue and enjoy dancing and have some vintage cocktails with us! The 1st Annual Dreamland Beach Party! On the shore of the East River, Water Taxi Beach boasts acres of real sand and a tented 60x40 wooden dance floor. Add ocean air, live Hot Jazz and the panorama of Manhattan as backdrop, and you have the city's beachiest jazz party ever. 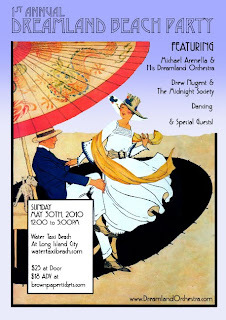 Bring your hats, parasols and beach blankets! Vintage Fashion Show and Sale presented by Odd Twin! dance legend and teacher Roddy Caravella, Odd Twin, and many other fabulous local vendors! Beverages, full bar and hot food will be for sale; ATM cards accepted. A limited amount of VIP picnic tables are available on a first-come-first-serve basis. They will be reserved for your party for the entire event and come with free parasols, copies of Zelda Magazine, and other special gifts! Table reservations can purchased for $25 per table (each table seats four). Note: This does not include admission price. E-mail jen at dreamlandorchestra dot com for table reservations only. Don't delay! Shuttle Service to Water Taxi Beach - Long Island City from East 35th Street by the FDR approximately every 15 minutes from 1- 3pm and then from 5 - 5:45pm. The fare will be $5 for a one way ticket. Travel to Borden and Second Street. At Borden Avenue and Second Street you will see the sign for the New York Water Taxi. We are not in all map and navigation systems. You can find us on Google Maps, by searching for, Water Taxi Beach 54-34 2nd Street, LIC NY 11101. Take the 7 train to Vernon Blvd/Jackson Avenue or the E train to 23rd Street/Ely Avenue. Then, take Vernon Boulevard. directly to Borden Avenue. Next walk past the Water Front Crab House and finally turn RIGHT into our driveway. 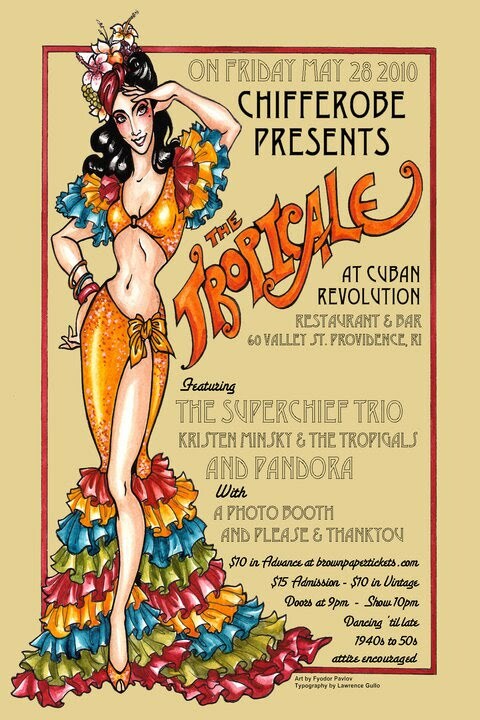 Kristen Minsky, of the tap dancing darlings the Minsky Sisters, is throwing a Retro Cuban party in Providence, RI called THE TROPICALE. The party is happening at the Cuban Revolution Restaurant & Bar. So let me get this straight. Authentic Cuban food. Kristen Minky debuting her "TropiGals" dance review. Mojitos. Daiquiris. And Cuba Libres. Si, por favor!!! Harkening back to an era when the movie musical was at it's height, the romance and heat of a latin escape was all the rage, and a floor show and a few generous cocktails were all one needed for a fabulous night, THE TROPICALE is all of the above!... Won't you join us for this premier opportunity to celebrate American culture at it's finest? THE FLOOR SHOW: the debut of Kristen Minsky & The TropiGals! e-mail Kristen Minsky at CHIFFEROBEcabaret at gmail dot com for more information. 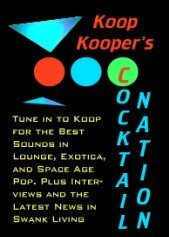 This week, Loungerati's resident cocktailian is the featured guest on Lounge impresario Koop Kooper's CocktailNation.net. Fredo discusses the origins of Loungerati, cocktails (natch), PDT, Tiki, and more with the Sydney, Australia based Kooper. The Fredo interview (albeit via not so good phone connection) happens right after Perry Mason by SpyFi. Please listen to the rest of the Podcast for Koop's tribute to Lena Horne. Below is the soundtrack to the Podcast, believe me Martin Denny would be proud! This week kicks off the Manhattan Cocktail Classic. This multi-day event promises to celebrate "the history, contemporary culture, and artful craft of the cocktail. Part festival, part fête, part conference, part cocktail party, the Manhattan Cocktail Classic brings together the unparalleled talents and opportunities of the bars, bartenders, and restaurants of our great city for five days of activities, both educational and celebratory in nature, championing the common ideals of authenticity, equality, sustainability, service, and pleasure. "In other words, this is an gathering of epic proportions and a cocktail lover's nirvana. The Gala at the New York Public Library - Friday May 14th 9pm -1am- If you go to one event, go to the Gala. Imagine if you had the world's greatest mixologists at dozens of stations making serious cocktails, paired with food, while great music and performances surrounded you all in charming confines of the landmark New York Public Library. Well dreams do comes true and the Gala promises to kick it off in style. Black tie optional, so of course that means Loungerati's Fredo and Grumpy Old Hepcat will be there in dinner jackets and black tie! Set sail on the Royal Princess and circle Manhattan while these premier bartenders take you around the world: Jacqueline Patterson of Heaven's Dog (San Francisco), Thomas Waugh of Death & Co. (New York City), John Lermayer of The Florida Room (Miami), Richard Boccato of Dutch Kills & Pain Killer (New York City), and Danny Valdez of Cure (New Orleans). The Dizzy Fizz Taste Maker's Punch - Monday May 17th 7pm -11pm - We have to take our stingy brim fedoras off to Selena Ricks, editor of the Dizzy Fizz; not only is her party a must attend for all festival goers, but she even got Cocktail historian and Esquire's drinks impresario David Wondrich to host!! What a way to celebrate an anniversary and birthday!! Clover Club - Julie Reiner is a pro at opening cocktail bars that are trend setting and quickly become your local. She tells the story of Clover Club, which won best new bar at Tales of the Cocktail 2009, all while you sip her delicious drinks. Sit in F14 - my seat which is the best in the house. Dutch Kills - Sasha Petraske has been hanging out a lot at this LIC cocktail haven. Petraske is and continues to be a game changer in the field with a half dozen stellar bars under his belt. We think Dutch Kills is the jewel in the crown. Accordingly, we are dispatching Giancarlo Zanetti to cover Sasha's talk. Painkiller - Richie Boccato and Giuseppe Gonzalez are literally still drying the paint on their Chinatown tiki bar, so they have a fresh take and recent bar opening experience to impart. Oh, and beware of the Scorpion bowl. Willy Shine of Contemporary Cocktails will also be slinging South Seas potions for your pleasure. Mayahuel - Phil Ward, I blame you for my current Tequila Old Fashioned addiction. Ward's bar/ restaurant brought Tequila as the base spirit of artisinal cocktail to the forefront. Oh and the Mexican food is killer! These events are selling out fast so get your tickets now! I arrived early for the Painkiller "friends and family" opening. Graffiti artist NOC (of Style Wars fame) was still putting the finishing touches to the graffiti mural covering the store gate. Giuseppe Gonzalez, the beaming new proprietor, was outside enjoying the proverbial calm before the storn. That storm bearing down on his new little Tiki Bar would be a tidal wave of bartenders, cocktailians, bloggers, and others in town for the Japanese Cocktail Technique seminar that wrapped up earlier at the Hiro Ballroom. Giuseppe let us in early and we took the "dug out" seats which in my opinion are always the best seats in the house. This gave us time to catch up a bit with out hosts before the madness began. Richie Boccato and Giuseppe Gonzalez, of Dutch Kills in Long Island City, have collaborated with business partners to open a new generation of Tiki Bar. As mentioned in our Tiki's Revenge post last winter, Painkiller isn't your typical kitschy tourist trap with badly made drinks. Inspired by New York's gritty 1970s and the drinks culture made famous by Donn the Beachcomber, Trader Vic, and most recently Jeff Beachbum Berry, PKNY makes serious cocktails but does not take itself too seriously. Graffiti murals fit in side by side with bamboo covered walls and comfy red booths. Giuseppe addressed the growing crowd as his partner Richie prepared the industrial strength blenders for service. "Come on you are all family - call it out." "Ok, Mai Tais for everyone!" Three drinks were served and Brooklyn Lager beer. The signature Painkiller, a Zombie served in a Fu Man Chu style tiki mug, and the original Mai Tai. Besides the three featured drinks, there is no formal cocktail menu but rather genres of drinks including, Zombies, Tiki Flights, Swizzles, Daiquiris, Frozens, a PKNY's (bartender's) Choice, a mini scorpion bowl called the "Cradle of Life", and the something called "The Bastards." This philosphy does not keep the menu stale and let's the barkeeper create bespoke or modified recipes based upon the availability of ingredients. As the old East Side Company space swelled to capacity with a whose who of mixology talent and favorite regulars, we threw down the ice cold Tiki drinks as the temperature reached tropic proportions. New friends were made, old flames were cursed, and shots in "skull" shot glasses were slammed. An hour and half later I had to give up the hard sought real estate of the dug out and make our way into the fresh cool air. Painkiller was off to a momentous start! PKNY formally opens on Friday May 7th at 6pm. I suggest you get their early and be prepared for scorpion bowls! I'll be having a Bermuda Swizzle! HERE WE ARE on Monday, April 26th, and it’s raining heavier than the drains can bear. I jump in a car right outside my posto di lavoro. The driver knows me, I say “Hello Kimchi!” Half a mile later, I realize I’ve forgotten the very thing. Cursing mildly, I wistfully put it down to the mists of my mind brought about by the fluid in my eyes. We double-back, I collect the goods, and return to the company of Joe Baxi, who has in the meanwhile set about checking under the hood. “We’re going to East 9th Street,” I reassign, “9th at Avenue C. For real this time.” I check my lid, and it’s still dry. What’s your criteria? Can anyone make anything? Sounds good. I hold open the door, follow him in, and slide a solid shake into the hand of Our Kid. To my fast delight, I learn there is a punch being prepared, and then, as if to broaden my smile I spot across from me a stirring Mr. Damon Dyer: among the most erudite and accomplished of the city’s best bartenders. A top man is Damon, with the humility that always underpins a fine craftsman of prospective greatness. Already the room is filling with the field and company. To my immediate right sits Selena Ricks, known to many as the brains and beauty behind the Dizzy Fizz blog. Way in the back is perched the pretty Kathleen "K-Rey" Reynolds and her husband Eugene who has been drafted into paparazzi duty. At the other end of the bar, apparently with her posse, lurks Rosemary Gray. There’s a lot of peering going on, a bit of the old ‘psyching-out’: it’s a mind game meme. For a good while after this, I utter nothing to anyone but Fredo and Mr. Dyer, and even then only in mere whispers of code. I now recognize the occasion as the moment our Fredo will have to turn over his cards. Thus, my role is to make his adversaries feel like they will have to bluff to steal. Soon enough, the bar has filled with the amateur bartenders and their supporters, and so without any further ado, Louis 649 owner, Zachary Sharaga, calls to order the attention of the room. The contestants will step behind the bar two at a time. They’ll be granted 10 minutes to create five original cocktails: four for the judges, and one to be tested by the gathered loyal! Until this moment, I had tasted punch after punch after money punch, in a kind of preempted Sugar Shane simulacrum. So they won’t have to invite me twice to straw-test each creation: us loungers dig experimental libations. There is no more time for easy distraction. Fredo’s up. The clicks stop. First, he clears a space in front of him. Then he sets forth on elaborating to the judges what it is he is making - the symbolism of the FIAT Cinquecento. We three in his corner marvel at his composure, though perhaps the most striking aspect of the whole spectacle is our instinctively recognizing that here is a bloke, our friend, absolutely in his element. Sure, anybody can be a mixologist, but not any one can be a natural as a bartender. The drinks look delicious, they are measured to perfection, the time is not an issue, the judges watch in anticipation, they are noting his technique and approving of his station. And then the coup de grace: he pulls out that 'very thing’, four personalized coasters with the iconic motor car, and, with a graceful hand, he signs them ‘Cin Cin!’ He presents the drinks. His cards are now turned over. FREDO IS ALL IN. The tension is rising. We are down to the nitty-gritty. At this juncture we’re informed that both of the runners up will, like the winner, have their cocktails featured on the Spring menu, while also receiving the much coveted Plymouth Gin Bartending Kit. As the first runner up, Schomer is also given a one-year subscription to Imbibe Magazine. These are serious prizes. The winner takes home a $100 gift card too. We are stunned. Jee Jee and I can do nothing but slap Fredo on the back! Hard! Quite a lot! But he hasn’t even reacted! Fortunately, the ever-eloquent Mr. Dyer is asked to explain how the judges came to their decision. And so there is nothing left to add, other than to ask that you please make haste to Louis 649 this coming season... If, like me, you haven't taken a vodka drink in awhile, now we can’t say no. Just remember to order The Ching-Kwi-CHEN-Toh! Rinse a rocks glass with Pernod Absinthe and discard. Fill shaker with ice, add Gin, Sherry, and elderflower liqueur and stir. Strain into the Absinthe-rinsed rocks glass over fresh ice. Squeeze lemon oil onto the cocktail and drop in for garnish. Shake vigorously with ice and serve in the glass of your choice. Top with a dash of Angostura bitters. Place on the counter in front of you and clearly speak the incantation "Episkey!" while gesturing your hand forward, as with a magic wand. Combine in bar glass, add ice, and shake rigorously until chilled. Double Strain into a coupe and garnish with grapefruit peel.